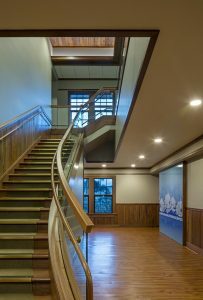 Ira J Freeman, AIA served as the Project Architect while an employee of Ferraro Choi and Associates and continued in the role of Collaborating Architect through the duration of the project after leaving Hawaii in 2012 to establish a practice in Texas. 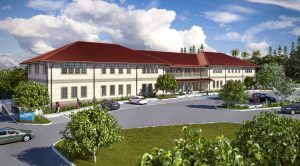 SPECIFICS: Phase 1 (Building 1 of 2), 20,000 square feet, 2-story, historic plantation style. 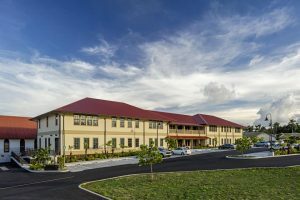 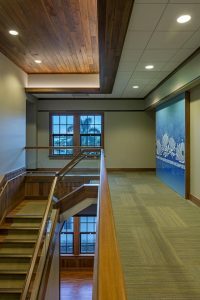 DESCRIPTION: The new HMSA Keaau Branch Office and Call Center Facility consists of two similar 20,000 square foot two-story buildings located in the heart of historic Keaau, Hawaii The building takes its historic plantation style design cues from the long destroyed wood buildings of Keaau village as well as historic examples around the Hilo area. 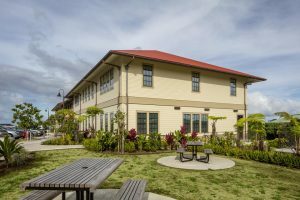 Features include steel windows, lap siding, historic railing profiles, deep set central lanai, single pitched 6:12 corrugated roof, and interior ohia woodwork including the central open stair with curved glass baluster.